Here's how Priorities work and what you can do with them. Priorities are the first thing you see when you log in to Kinnek. 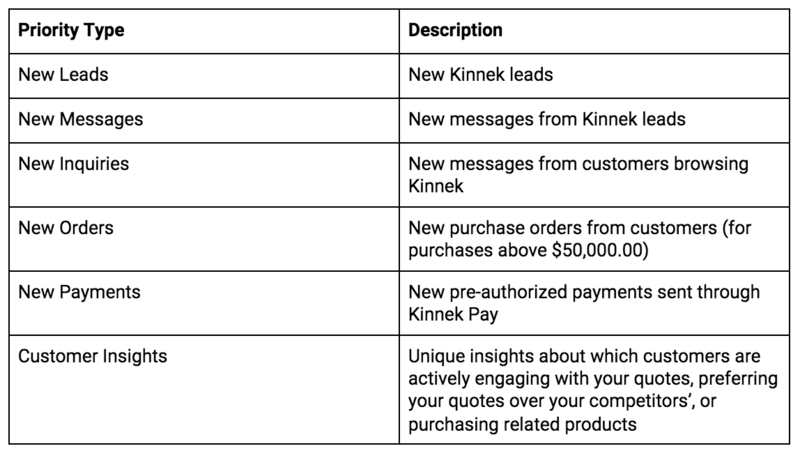 They are a shortlist of all new customer activity from your Pipeline: new leads, new messages, new inquiries, new orders, new payments, and customer insights. By highlighting customers that are waiting for a response, they help you organize your workflow and manage relationships with less effort. When you click into a new Priority, Action Items show you exactly how you can respond. Click on the desired Action Item to continue. Learn more about Action Items here. Leads within your Priorities also appear in their designated Pipeline stage. Completing an Action Item clears a lead from your Priorities by the next time you visit your Priorities page. You can continue viewing that lead in your Pipeline.